Limbs 4 Life caught up with two students currently studying the Master in Prosthetics and Orthotics at Melbourne’s La Trobe University to find out what their future had in store. Emma Davis is a fourth year student and will complete her qualification in September this year. Cynthia Delinac is currently in the second year of her studies. Why the interest in a career in the field of prosthetics? Emma: I always felt drawn to the area of health and working with other people. I grew up being exposed to the health industry as my Mum was a nurse; I just wasn’t sure which area of Allied Health would suit me best. Cynthia: Since I was young I have had an interest in both helping people and construction. Although I was interested in construction I couldn’t see myself working as a tradie, and I didn’t think there was a career that could combine my two interests. But, when I was in Year 11 I attended an Open Day at La Trobe University and was exposed to the Masters in Prosthetics and Orthotics program. Immediately, I found the course for me! I made sure to select subjects in Year 12 that were pre-requisites for the program and was thrilled when I was accepted after finishing school two years ago. Was there one defining moment that led you to make the decision to study prosthetics and orthotics? Emma: I was actually leaning towards Speech Pathology when I went to help out at my child’s local school. In my role as a Teacher’s Aide the very first child I provided support to was wearing a Halo Brace. This inspired me to look into the various Allied Health courses on offer at La Trobe University (I previously studied Arts) and decided on Prosthetics and Orthotics. I’m creative by nature and loved the idea of problem solving in a ‘hands on’ way. Prosthetics and Orthotics seemed like a much better fit than any of the other allied health courses. Cynthia: Attending the Open Day, and doing further research into the profession, was a very defining moment. However, I was also strongly influenced by my own personal experience of orthotics. I have Scoliosis (curvature of the spine) and during my teenage years wore a Boston Brace to treat this condition. This necessarily meant that I attended the Royal Children’s Hospital and worked with an Orthotist, who oversaw my treatment and fitting of the Brace. After I identified the Masters in Prosthetics and Orthotics program as my post-school pathway I then discussed the course in more detail with my Orthotist and felt even more confident that I was choosing a program and career that would suit me. What do you hope to get out of working in the industry? Emma: I really want to help people get their independence back, regain their mobility and function. During my first placement, I had the opportunity to see the difference an orthotic device made to clients’ wellbeing and mobility, so I’ve already had the opportunity to see some good outcomes. I really love the variety that my job will provide. No two clients will be the same, so I expect that each day will provide new challenges and opportunities. Cynthia: I hope that, once I am qualified, I will be in the position to assist people to achieve their goals in life. I’m particularly interested in working with children because I understand, from personal experience, how critical quality early intervention support is. Addressing the physical needs of children and providing them with treatment and devices that will make them more confident, comfortable and independent is really important. Next year (3rd Year) I will start my industry clinical placements, which will be a mix of prosthetics and orthotics, and I’m hoping to be placed at the Royal Children’s Hospital at some stage. At the moment I’m leaning towards orthotics, but that may change after I’ve done placements and formal training in prosthetics. How has the course prepared you for the role? Emma: The course has been great as it has given me an insight into what I can expect and I’ve also had the opportunity to work with a number of volunteer patients. It’s been interesting listening to them and hearing their needs, their stories have been really inspiring too. Cynthia: In the first two years our education focuses on anatomy, physiology, biomechanics and allied health matters. More recently we have started to enter into the design, fabrication and construction of devices which I am absolutely loving. We have also had some fantastic amputees come into our classes to talk about their amputation, rehabilitation and clinical experiences. These people are so generous in giving their time to talk to us students, share their personal stories and allow us to act in the role of clinician and ask formal questions. Asking questions of amputees has really helped me to be client focused and understand the importance of that. I know that will greatly help me during my upcoming placements and when I’m working in the ‘real world’. Is there any particular area or patient group that you would like to manage? Emma: It is hard to pick one area at this early stage in my career and I’d like to remain open to all areas of Prosthetic and Orthotic patient care. My first placement was at the Royal Children’s Hospital (Melbourne) which is fairly specialised. I really enjoyed that experience although initially I was a little bit concerned (being a Mum myself) about seeing and working with children experiencing difficulties. It didn’t turn out to be a problem at all though and was a great first look at the professional side of Prosthetics and Orthotics. Cynthia: In addition to wanting to work with children, I have also been thinking about working in some developing countries. I know there is a desperate need for qualified Prosthetists and Orthotists in many third-world countries and I would like to offer my expertise and skills in those regions. Do you have a particular interest in upper or lower limb amputees? Emma: I think the developing technology of myoelectrics is fantastic and I am very interested in how it is helping to restore and/or provide function to upper limb amputees. The movements and functions performed by the hand are so complex, to think research is getting closer to being able to replicate it is very exciting. 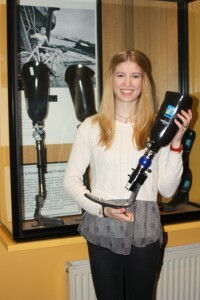 Cynthia: If I move into prosthetics I think I would like to work with lower-limb amputees. I think that assisting people to ambulate (walk) safely and regain independence would be very satisfying for the patient and rewarding as a clinician. Given that technology is changing all the time, how do you think you can influence changes in funding that lead to positive outcomes for patients? Emma: Some of the high end prosthetics are far out of reach for most patients and the current system doesn’t support funding for these components. I hope that the NDIS (National Disability Insurance Scheme) will help to address these financial gaps. Cynthia: While technology may increase costs, I think it is important that prostheses and orthoses are made accessible to all people as that will assist people to live productive and healthy lives. Amongst the students we have been talking about 3D printing technology recently and some are worried that the increased use of 3D printers might lead to less jobs in the profession in the future. However, I don’t think that will be the case as there will always be a need for qualified clinicians to develop treatment plans and fit devices regardless of the technology used. I think it is an exciting time that we are entering into really. Emma: Meeting a number of amputees through our course I’ve heard a few stories about their experience of pain and how it affects their lifestyle and mobility. I would like to think that sometime in the future I might look at conducting some research about this and how pain influences their mobility outcomes. I’m very excited to begin my career in this industry as there is a lot of scope to make your mark! 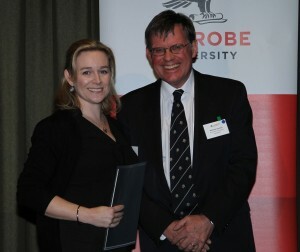 Cynthia: I just want to tell others that the course at La Trobe University is a really interesting and important one. If anyone is thinking about this as a career they should think about attending an Open Day or speaking to the lecturers there. I also want to thank all the amputees that come and talk to us students and let them know that we really appreciate and benefit from them sharing their stories with us. Oh, and thanks to Limbs 4 Life for letting me contribute to this article.